I’m a bit of a beer/brewing book collector, I have a Library of twenty or so books, and my amazon wish list is sure to have a few brewing books on it. I have recipe books, basic brewing books, advanced technique books, scientific books, historical brewing books, books about starting a brewing businesses, the list goes on. I have so many unread, that I made a goal for 2014 not to purchase any more books until I’ve gotten through the backlog. Fortunately I preordered this book back in March of 2013 so it doesn’t count as failing against that goal. When this book finally arrived I did not expect to pick it up for some time, or do what I did, read it cover to cover in a week. It’s 150+ pages but it’s a quick read because half are filled with recipes. The book is 90% vintage english beer recipes, with a few pages of traditional recipes from other european regions, so don’t expect vintage us, or belgian recipes. However the english styles it does cover are very enjoyable. What I found most fascinating in reading this book is the fluidity of beer styles over time, and learning the driving forces of those changes. It’s enlightening is to see the impact of tax, fashion, technological improvements, and war on the styles. This gives insight in to what spawned the styles we perceive as traditional english styles today. The reason we have the low abv milds, as compared to their much higher gravity ancestors. As well as to now understand that Mild meant fresh ale, rather than aged stock ale. To learn that as hydrometers became available, and gravity quantified, that pale malt began it’s dominance in recipes. If there is a disappointment it’s that a majority of the beer recipes for a particular style across brewers from the same period are very similar. They may differ in a few gravity points, an addition of caramel / invert sugar, but there is little differentiation between the malt bills or hopping in the recipes. It’s not to say the beers of the time were indistinguishable, but rather that it’s hard to express the differences in the period specific malts from the brewing logs. The recipes don’t distinguish the brands of malt, which would be pointless since they don’t exist in that past form now. 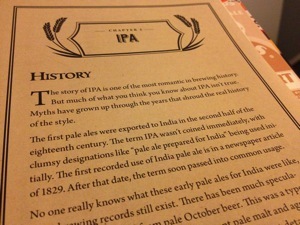 This is explained in the malt section of the book. The other unifying aspect across the recipes is they all use the same few varieties of hops. 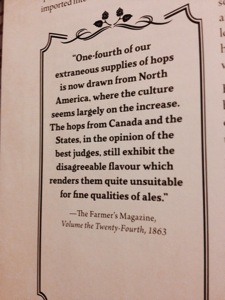 There just weren’t the abundance of hop varieties we have now. With that said, I tagged many interesting recipes, and am hoping to brew a few recipes from the book in the coming months. I plan on brewing a low abv mild, a East India Porter, and a traditional english barley wine. I’m also very interested in brewing two of the lacto / kolsh beers in the final chapters of the book broyhan and kotbusser. In my opinion a mark of a good recipe book is how many recipes you want to brew and how excited it makes you about the styles presented. If that’s true, this book is certainly a hit with me. 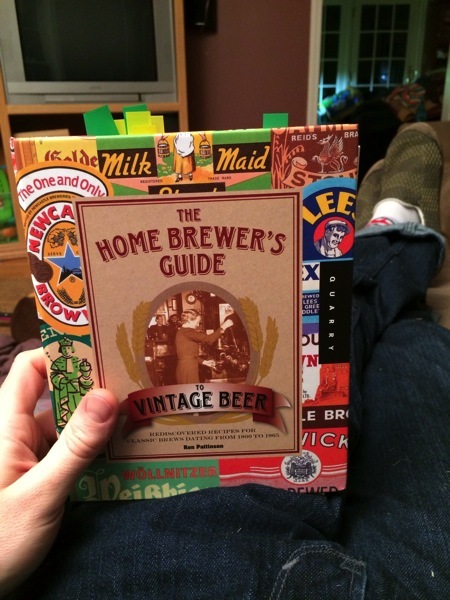 The recipes are clearly written for homebrew use, and should be easy for anyone to follow. Part of me thinks it would be extremely cool to brew and share a few bottles with Ron, Dan and Martha, the other part of me is scared that I’d fail. Here’s to not failing.